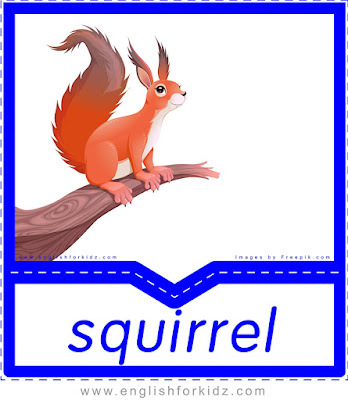 Matching pictures to words is another fun way to help kids memorize English vocabulary. Such printables make a part of my Christmas kit for which I have created a set of worksheets designed for teachers to diversify their classes dedicated to Christmas. I often use the kit during the holiday season. 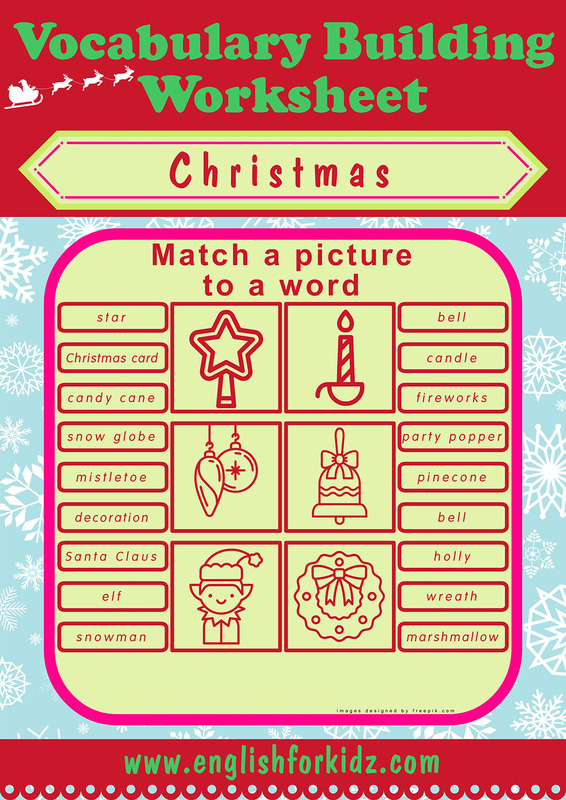 My little students love solving Christmas crosswords, finding words in the word search puzzles, and matching words and images with my picture-to-word and word-to-picture matching worksheets. 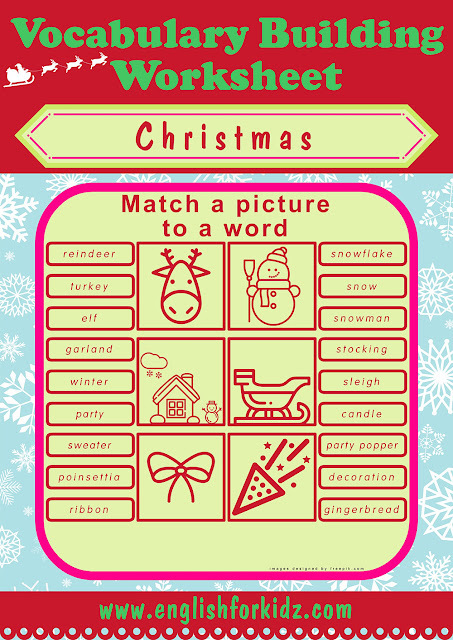 All my Christmas worksheets are based on the vocabulary introduced with a set of printable flashcards. 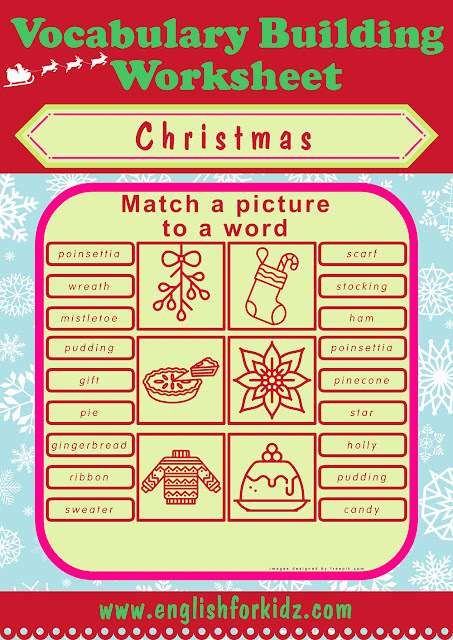 The vocabulary can initially be strengthened with my Christmas dominoes. 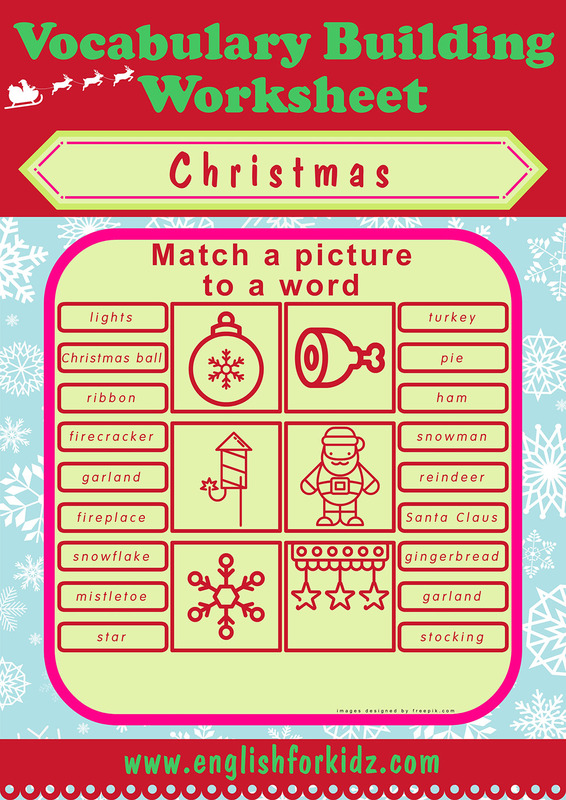 There is another fun game I designed for the purpose of memorizing and retaining the vocabulary – Christmas bingo. 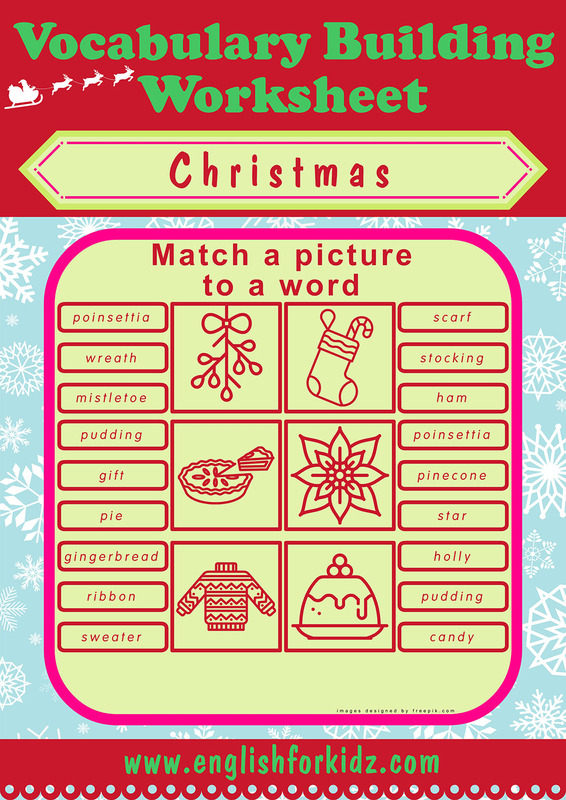 Those printable teaching materials cover some 50 nouns related to modern Christmas traditions, food and seasonal clothing. 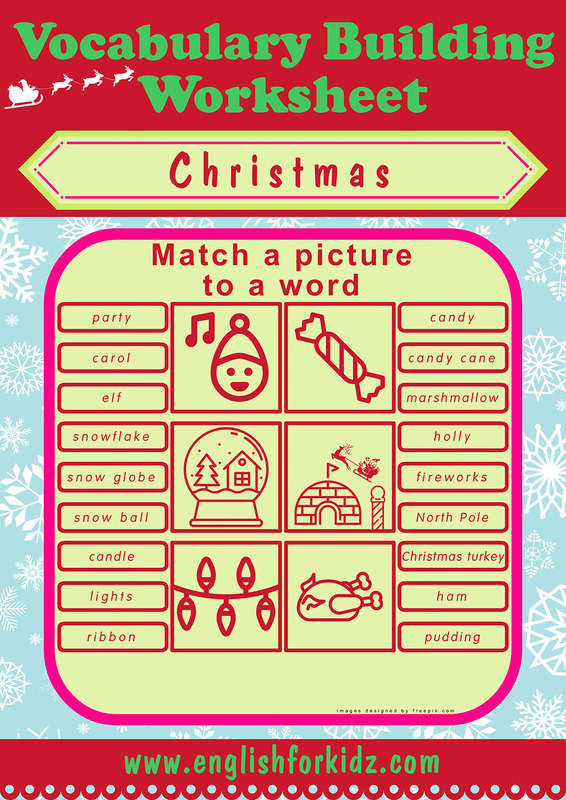 I hope my colorful games, flashcards and worksheets will help ESL teachers bring more fun into language learning during the most wonderful time of the year. 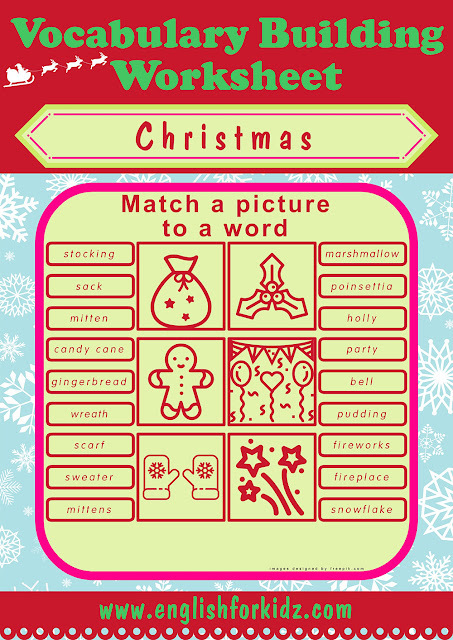 Christmas worksheet for learning and memorizing the following vocabulary: mistletoe, stocking, pie, poinsettia, sweater, pudding. 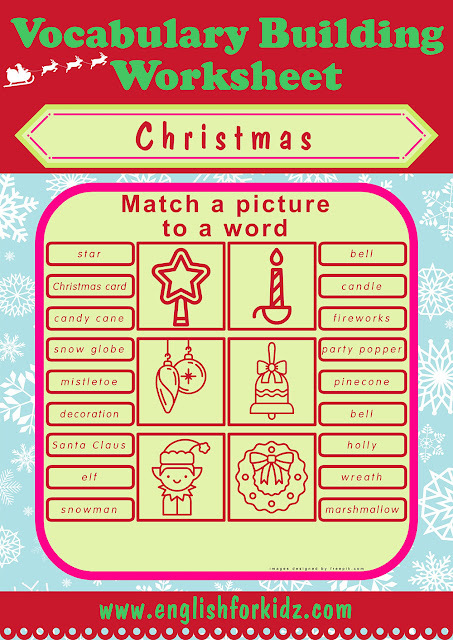 Christmas worksheet for learning and memorizing the following vocabulary: star, candle, decoration, bell, elf, wreath. Christmas worksheet for learning and memorizing the following vocabulary: Christmas ball, ham, firecracker, Santa Claus, snowflake, garland. 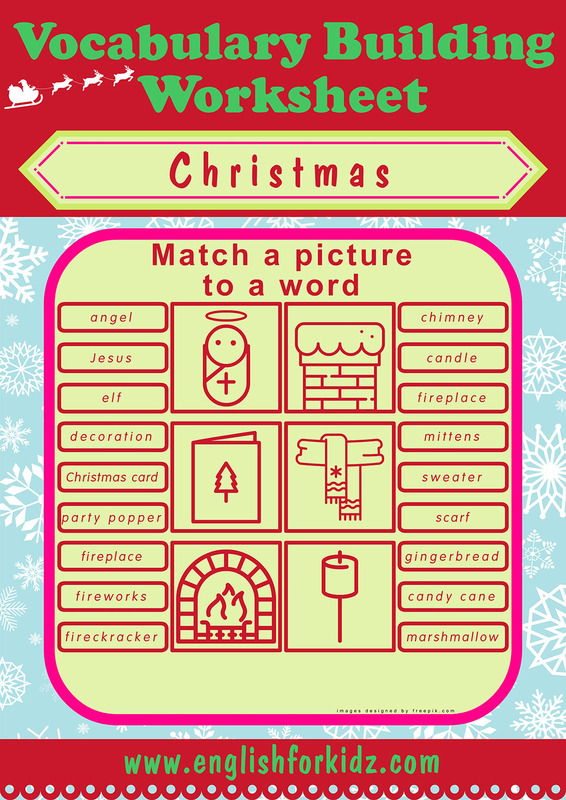 Christmas worksheet for learning and memorizing the following vocabulary: Jesus, chimney, Christmas card, scarf, fireplace, marshmallow. Christmas worksheet for learning and memorizing the following vocabulary: carol, candy, snow globe, North Pole, lights, Christmas turkey. 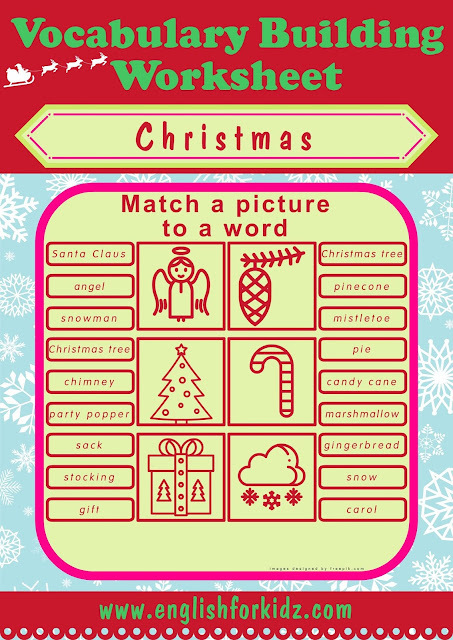 Christmas worksheet for learning and memorizing the following vocabulary: angel, pinecone, Christmas tree, candy cane, gift, snow. 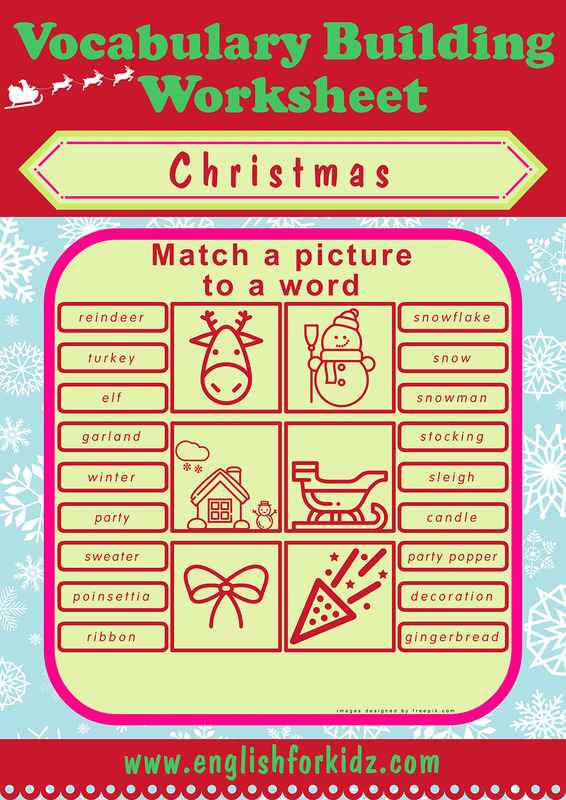 Christmas worksheet for learning and memorizing the following vocabulary: reindeer, snowman, winter, sleigh, ribbon, party popper. Christmas worksheet for learning and memorizing the following vocabulary: Santa's sack, holly, gingerbread, party, mittens, fireworks.